Usher's relationship/marriage to Foster (who is eight years his senior) was easily the most controversial relationship he was ever in. Foster was Usher's stylist and was referred to as his "longtime girlfriend" by MTV News when they reported the couple was engaged in March 2007. The couple planned a lavish wedding for that July, but they suddenly canceled it—only to get married in a private ceremony a few days later. That November, Tameka gave birth to Usher's son, Usher Raymond V. A year later, she gave birth to another son, Naviyd Ely Raymond. Despite the "happy couple" look, there were a lot of rumors about the couple: Tameka was controlling Usher, Usher was cheating on Tameka, Usher's mother didn't get along with Tameka which is why he fired her as manager. Despite the rumors, the couple didn't split. 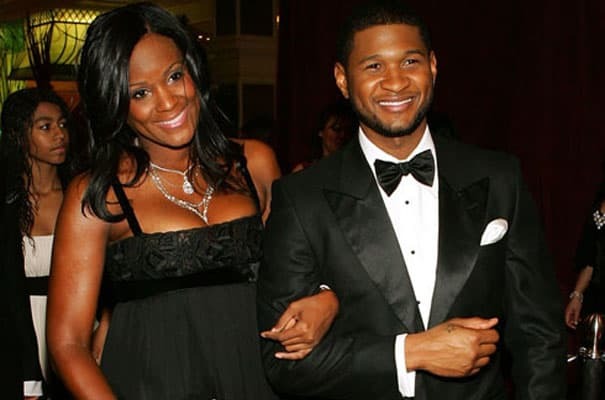 In February '09, Tameka suffered cardiac arrest while getting liposuction in Brazil, which forced Usher to cancel his Grammy night performance. By June, the couple had filed for divorce and it was reported that they hadn't lived under the same roof for months. But things didn't end there, in October '09 Usher had to call the police because Tameka keyed-up his car. Geez, this guy catches a lot of bodies, but he's had plenty of drama to match.